Four hours into the hot heat today we stopped in the small town of An Daung Toeuk for lunch. During lunch at the Blue Columns restaurant we were surprised when a couple of other tourists arrived. The restaurant, and town, happen to be the jumping off point for trips to the ecotourism town of Chi Phat. With a big hill looming if we chose to continue on our planned route, and a little peer pressure from our fellow travellers, we changed plans, and headed to Chi Phat. This decision meant Jane finally got to ride along a red dirt road through the jungle. The 17 km between the highway and Chi Phat was almost deserted – much of the land was ex-farmland, gradually being reclaimed by the forest. Red dirt road to Chi Phat. The ride to Chi Phat has several slow climbs, on loose red dirt and gravel. It was just after 1pm and hot as hell. We guzzled our water as we pushed on. Hardly anyone passed us as we rode through the countryside and jungle, but a few people on scooters did stop to ask us where we were going, and point us in the right direction. Young girl we met on the roadside, near Chi Phat. Family preparing for the day near Sre Ambel. The fields that were being worked were mostly sugarcane fields, the product of which was presumably destined for the huge Koh Kong Sugar Factory we passed earlier in the day. The canes were small, only about one foot tall. Yet another sign that despite the oppressive heat, it is, in fact, spring. After an hour of sweating our way through the countryside, we arrived at Phipot river. A small bike and pedestrian ferry, really just a floating tabletop with a motor, was waiting at the river’s edge. Lo-fi ferry ramp, Chi Phat. As we approached, a man jumped out of a nearby hammock and ushered us onto the ferry, pushed off, and sailed us across the river to Chi Phat. Bikes on the “ferry” to Chi Phat. The journey lasted roughly one minute; the river is not very wide here. Three kilometres outside town is the Chay Khpos waterfall, which, at this time of year is less waterfall, more light rapids. We had been dreaming about jumping in the river all afternoon, so as soon as we got checked into our wood cabin / guesthouse, we hopped on our bikes and headed out there. Cycling the main street of Chi Phat. A couple of the guys who had passed us on the road were down at river washing the red dirt from their scooters. A few Khmer children were also down at the river. Children at Chay Khpos waterfall, Chi Phat. The two young ones were jumping in, goofing around, while the oldest one of them was very carefully washing her little sister’s pink and white backpack. It must be very hard to keep that clean surrounded by rich red dust. We jumped in with the kids and rinsed off our layers of dust and sweat. So nice to be in some fresh, cool water. He loves making a splash. Refreshed, at Chay Khpos waterfall. It wasn’t Canadian mountain stream cold, but it was refreshing. Solid rock, perfect place for a headstand, Chay Khpos waterfall. Just after Jane remarked that she was sure glad this wasn’t one of those waterfalls filled with backpackers in bikinis, a dozen Aussie blokes joined us at the watering hole. 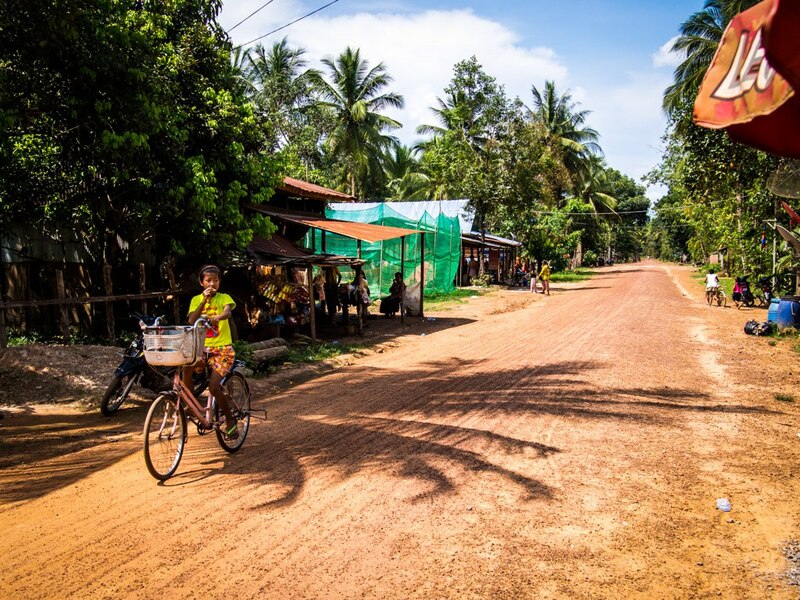 They are on a Cambodian dirt bike tour, spending their days riding through the jungle. Some of them had blisters from the humidity, one of them was on crutches, and they were saying the heat in the deep jungle was intense. Still, it sounded like quite a trip. This looks like fun, and faster than a bicycle. They were certainly enjoying themselves in the watering hole, with beer and sunshine. Invasion of the Aussies at Chay Khpos waterfall. Much of the talk was about tomorrow’s ride, which was going to include a ride across the waterfall’s edge. We saw several locals ride their scooters across without hesitation, but the Aussie guys are on big, tall dirt bikes, and presumably aren’t as adept at handling them (see crutches dude above) as the locals, who cross this every day. Easy peasy if you know how to do it, Chay Khpos waterfall. They invited us to come watch them make the crossing tomorrow morning, almost promising us that at least one of them would fall in.